But the game makes you work for these items. Once you’ve scanned the amiibos special customers come to your store. 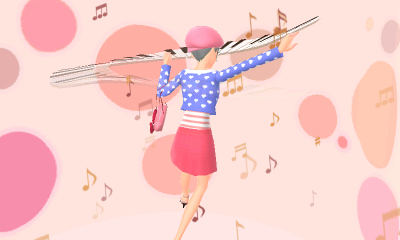 It’s quite obvious (maybe not the one that’s wearing the star barrette) that they’re special because they’re wearing the special items and they want you to make outfits for them that match those items. On another note: these customers are all Girl’s Mode versions of the Miis that are registered as the owners of your amiibos. So the little silver-haired girl is their interpretation of my silver-haired mii for my New 3DS. 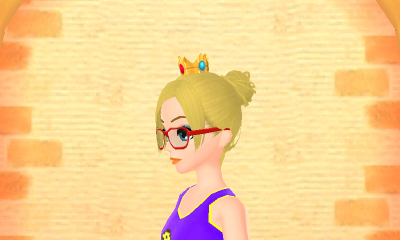 And the cute Princess Peach blonde—that’s my mii on my US wii because I used her for playing Mario Party the other day. 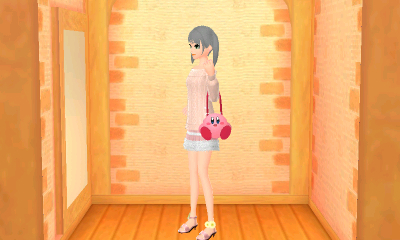 The original girly outfit I made to match the kirby purse. She liked the clothes. She even bought the clothes, but she didn’t give me the purse. And I really wanted that purse. 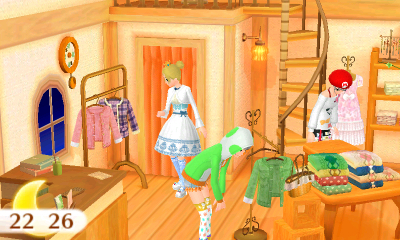 So after I had purchased some more clothes I re-scanned the amiibos and fortunately the customers showed up again. 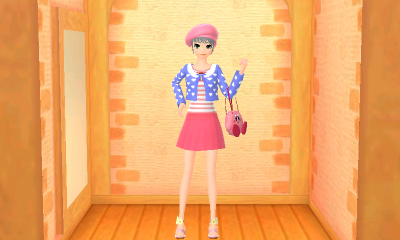 This time I gave the kirby girl a mostly pink girly outfit with a blue sweater (I was trying to match Kirby’s eyes). 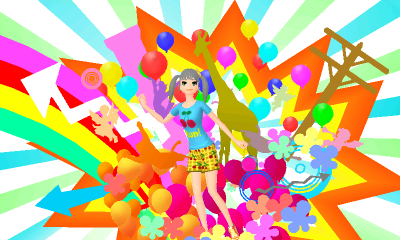 My retry outfit. I still only had those shoes from the beginning, but everything else was new. 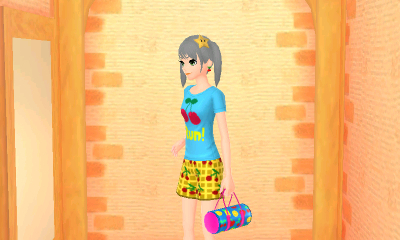 Not only did she buy the outfit, but after that she gave me the purse too. Score! I did the same thing with the girl wearing the star barrette. She wanted a pop-style outfit to match her barrette. While I didn’t have anything overtly star-themed, I decided to try yellows and blues and she mentioned that when she was telling me she liked the outfit. And wow did she like the outfit. After checking out she gave me the star barrette. and she gave me the barrette. I still have to get the rest of the amiibo items, but at least now I know that I have to make them super happy with the outfits and that if I screw up for whatever reason I can just re-read the amiibos and try again. Princess Peach’s crown will be mine. Also, I really love what they did with my Mii. She’s so cute! 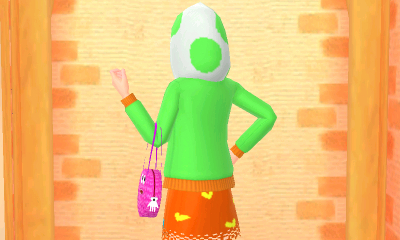 The yoshi hoodie will be mine as well. I think I need a few more pieces of pop clothing though. And just to rant about amiibo for a second, I’m really happy they didn’t make you use any of the really rare amiibos, because the only rare-ish one I have is Shulk (who I scanned btw. He just imports another star barrette customer). The main site shows the Mario Party amiibos, but you can use their Smash Brothers version instead. I used the Mario Party Mario, and Smash Brothers Peach, Yoshi, and Kirby. 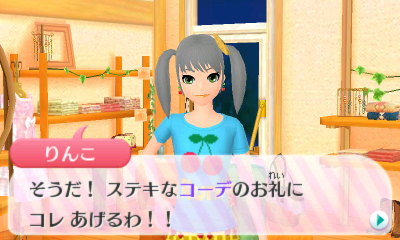 And now, I have to try and get the rest of the items. Wish me luck! 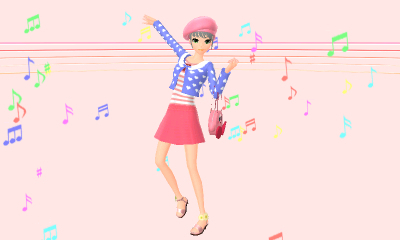 This entry was posted in Girl's Mode, Video Games and tagged amiibo, キラキラコーデ, style savvy by Jennifer. Bookmark the permalink.